As is usual, I am behind in blogging, but here is an attempt to catch up. At the end of August Rebecca, Raquel & I got crafty during our self-invoked DIY Staycation 2011! We had contemplated going somewhere, but ended up deciding just some down time at my house being crafty sounded just as appealing and hopefully cheaper! We had all recently been inspired by some Pinterest crafts and were dying to try some out...So, that's what we did! Goal: Equal parts chill time, craft time, and fun time! We started off our weekend on Friday evening. The girls arrived at my house and then we headed off to dinner & a supply gathering stop at Hobby Lobby! We had decided to each decorate a pair of shoes (yes, idea originally from Pinterest), and possibly some other crafts that may come up along the way. After some juicy hamburgers from 5 guys, we headed off to Hobby Lobby to make some decisions and hope to be inspired. The rest of the night Rebecca started her artistic design on her Chuck's while Raquie & I just did some planning for how we would cover our Toms with fabric. Saturday morning we woke, wasting no time at all, to get crafting, after a nice cup of joe & some pancakes, that is! Shortly after lunch we realized that we had run out of glue, so we had to go to JoAnne's to be able to finish off our shoes. This was our first trip to the BRAND NEW JoAnne's in Katy, and let me tell you, it did not disappoint! 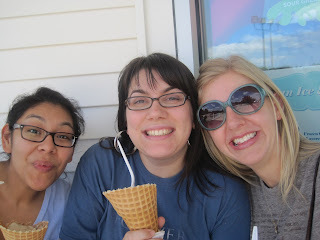 We also happened to be passing by Ritter's frozen custard, so we decided to treat ourselves to a yummy cold treat! 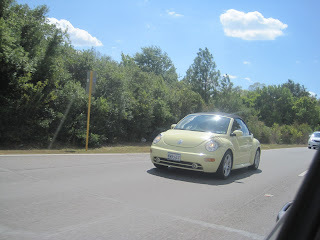 On our way home we saw this, look closely, yes, it's a car with car lashes! Gave us a good laugh for sure! Unfortunately we had to break things up that evening, as Rebecca & I headed to church. I think most of our shoes were close to done by this point. After church, we reconvened at me house to make yummy lasagna! I believe we watched another movie and put some finishing touches on our crafts while also flipping through some magazines! Ah...perfect girl bonding time! Of course, we all headed to church on Sunday morning. After church, Rebecca & I made 7 layer dip tostadas, de-lish! Yes, this idea came from Pinterest as well! Sunday afternoon was filled with laying in bed, girl talk, naps, and topped off with a viewing of Titanic! By Monday our shoes were done, Rebecca had made a cute rosette necklace and I had painted some canvases for my friend's birthday. Raquel had gone home to spend time with her mom, so Rebecca & I decided we had no other choice but to hit the 290 Outlet Mall!!! Man, did I get into trouble there! All in all it was a great long weekend, with a perfect balance of fun and crafting! Love you girls!